• 100 BULLETS TPB VOL. 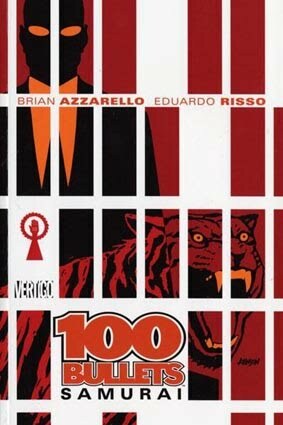 7 "Samurai"
• PLOT SUMMARY: Brian Azzarello's and Eduardo Risso's multi-award-winning crime saga 100 BULLETS continues with the seventh collection. This volume collects the story "Chill in the Oven," featuring Loop Hughes, who is joined in prison by a very unwelcome (and surprising) acquaintance. Also included is "In Stinked," as Jack Daw finds himself in a roadside zoo face to face with several varieties of wild animals - both savory and decidedly unsavory.